T he city's moviegoers heaved a collective sigh of relief after the opening of "Gone Baby Gone." The reason? Ben Affleck's directorial debut avoided the "Hahhvahhd Yahhd" syndrome that plagues so many Boston films, sticking instead to well-scouted locations, spot-on accents, and authentic sartorial details. It's the last touch that delights one local in particular: Jack Doherty, owner of Dorchester apparel company College Hype, whose T-shirts make their big-screen debut in the film. In one scene, as a kidnapped girl's mother defies police in her decrepit Dorchester triple-decker, a friend slouches beside her in a pink College Hype T-shirt, emblazoned with the words "Dot Rat." Later, in a scene shot at Southie watering hole Murphy's Law, the bartender sports a "Boston Irish" shirt, from the company's Irish Hype line. "I thought it was awesome," Doherty said of the placement, which has caused orders to spike. College Hype's 15 minutes came about serendipitously. Two years ago, when Affleck was here filming, people kept coming into the store on Gallivan Boulevard and buying him stuff. "So through that, the costume people found out about us," Doherty explained. "They came in and bought about 50 things." Doherty and his staff weren't sure if anything made the cut until the calls and e-mails started coming in on opening night. "A few people called me at 10 at night," said Doherty, who had yet to see the movie. "I've gotten 15 or 20 calls from people who knew the Irish shirt was ours." Doherty started his business in 1987 while an undergrad at Westfield State College, designing humorous shirts ("No Fun Allowed at Westfield State" was his debut) and selling them to students. 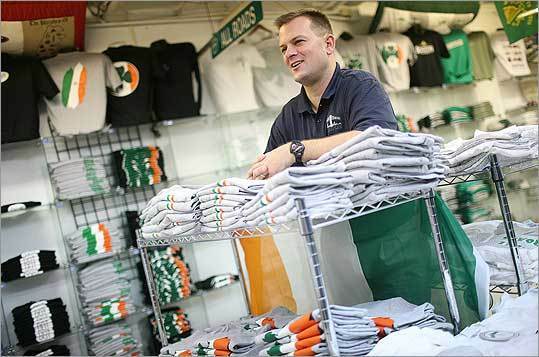 After college, Doherty continued printing original Boston-themed shirts, silk-screening at night in his parent's basement and working days at a student loan company. "I was working literally 20-hour days and killing myself," Doherty said. So in 1996 he plunged full-time into an apparel career, launching College Hype out of his Dorchester apartment. One of the company's first breaks came with its "Parishes of Dorchester" shirt. "In Dorchester it was always, 'Which parish are you from?' " said Doherty, who grew up in St. Gregory's Parish in Lower Mills. "So we came up with a shirt that said all the parishes on the back. We'd sell them to the schools wholesale, and they'd sell them to raise money." Then, three years ago, the company got its first taste of national visibility. It was on the eve of the 2004 playoffs when Doherty got an urgent call from Curt Schilling's publicist: The pitcher needed 25 shirts in 24 hours with the words "Why Not Us?" printed on the front. On the back it would say: "If 25 men believe they can . . . They will." The now-legendary shirt, first spotted on Schilling during his Game 2 ALDS postgame press conference, became College Hype's bestseller. Schilling sported another College Hype T-shirt during the big parade last week. It said "We Did It again: Thank You Red Sox Nation." Today, Doherty manages a loyal crew of 22 artists, salespeople, and support staff out of an office with two showrooms, in-house printing presses and embroidery machines, and a second-floor shower for when late nights turn into early mornings. The company produces eight Boston-themed lines of shirts, hats, and stickers - including Dorchester's ubiquitous "DOT" sticker, which also appears briefly in "Gone Baby Gone" - and does custom screen-printing and embroidery work for clients such as the Red Sox Foundation and 38 Studios, Schilling's game development company. Doherty's success story earned him a call-out in Donald Trump's latest book, "Trump University Entrepreneurship 101," which sings the praises of the local "bootstrapper." While Doherty considers the business a work in progress, he takes heart in his company's big-screen validation. "You work 10-, 12-hour days, nobody knows what you're doing," Doherty said. "I was really excited."